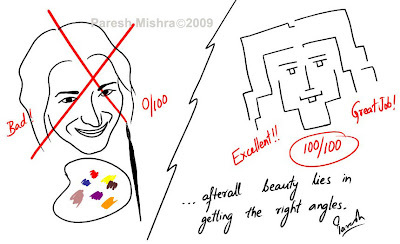 Nice, but I wonder why you term the drawing on the left as 0/100. Is it suggestive of something? Thanks Akhilesh. In this sketch I was attempting to caricature our obsession of searching for the perfect angles while drawing pictures or shooting photographs--as if beauty lies only in a particular angle. The picture on the left is drawn from an odd angle to make the woman more beautiful, and the picture on the right is making fun of that obsession of finding the perfect angle or the "right" angle. The 0/100 score is just an exaggeration.